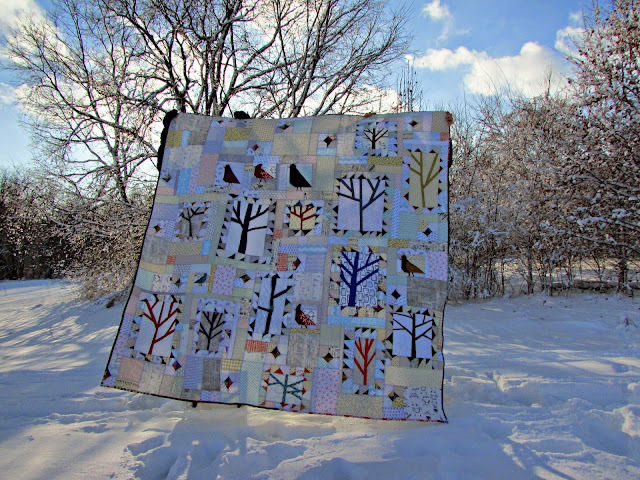 Last year I was lucky enough to participate in the New Quilt Bloggers Blog Hop. I had just barely started this blog and I learned so much from the other participants. I also got the chance to join my first bee. I started worrying about what block I would have others make for me months in advance. I had Gwen Marston's Minimal Quiltmaking book on my nightstand and was inspired by her beautiful tree on the cover. I referred my bee mates to the Free Pieced Tree Tutorial on Pinkadot Quilts. For some of my bee mates, this was their first attempt at improvisational quilting. I received blocks of many different sizes, so my first challenge was to set them. I used graph paper to help me. I set my outer boundaries for the quilt to finish at 96" x 96" and roughly drew in outlines of where I wanted the trees, birds and sparkly stars to appear. 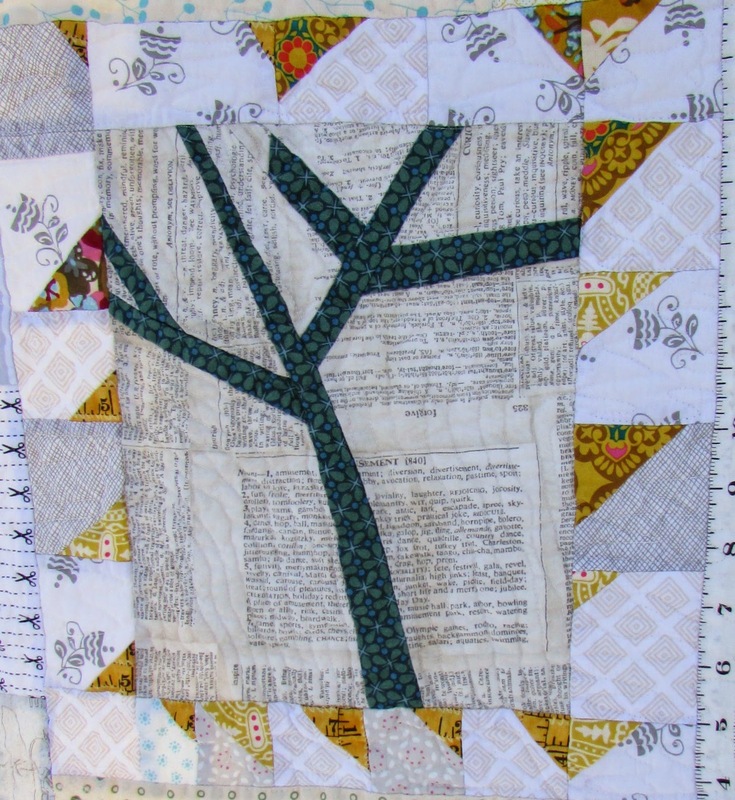 As I constructed the quilt, I chose trees that were similar in size to my sketched boundaries and either trimmed or added more to arrive at the size I had made on my scaled piecing map. I made the background in slabs using my piecing map as a guide for dimensions. I marked off sections that I had completed with a highlighter as I went, or I would show a picture of my map. The good news is that it helped me end up with a queen size improv quilt that is square. Here is the link to my original post on The Lovely Woods. 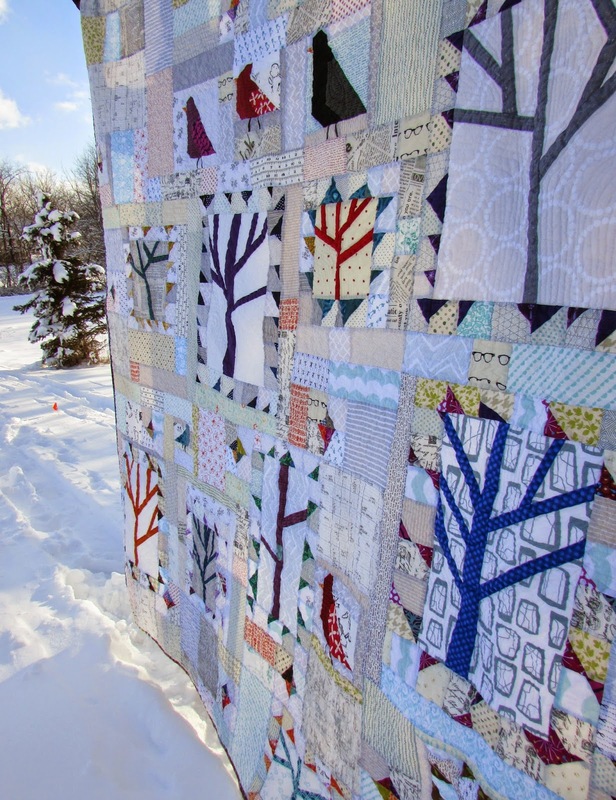 I talk a little bit more about the story behind the quilt and the way I set it. 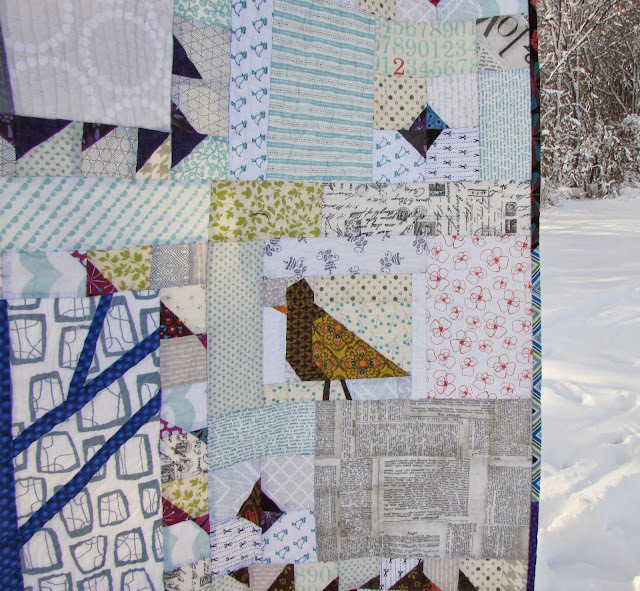 Also, I had a lot of feedback about the little birds from this quilt. I didn't feel quite finished with them either, so I made another bird quilt, Red Letter Day and also wrote an Improv Bird Tutorial. There is another round coming up for the New Quilt Bloggers. If you have been blogging for less than two years, please consider joining. The information I received was invaluable. I also will be lurking along this year because I feel like I still have so much more to learn! Signups start on May 18th. Linking up to Amy's Creative Side. I think it is really awesome that the blog hop last year lead to a bee participation for you which lead to a queen sized quilt! That is pretty awesome. Thanks for hosting this year's series, Yvonne. There is so much to get proficient at so quickly when you decide to blog. It's nice to know someone is there to help! Several weeks back, I followed some birds from Pinterest and arrived at your earlier posts about making this beauty. It's what made me decide to add your blog to my feedly. Well, this quilt and the bear. Very cool. I loved seeing your quilt! Thank you, Debbie. I told myself that I would take it off our bed when the seasons changed, but I haven't quite had the fortitude to do it yet. I think the wool batting will force me to in a few weeks, though. I love this quilt and will be voting for yours! Thanks, Kelly. And, thank you for writing that tutorial. I hope lots of people use it to make their own forests. I remember seeing an earlier post about this quilt and thinking ' this is so brilliant and beautiful' I'm really glad you're entering it so I can vote for it. Awesome!! Thanks! I am glad you remembered it. Thank you. I appreciate hearing you say so! Thank you Silvia. This is still one of my favorite quilts. I had fun playing in my scraps! I absolutely LOVE this quilt!!! You get my vote, my applause...and a standing ovation! Paulette, thanks for making my day! I love it too (I am laying under it right now)! I can't bring myself to take it off the bed even though it's more of a winter quilt. I will have to make a summer version of the woods. I'm pretty sure I have commented on this quilt before, but I still love it! The cute birds again the low volume improv piecing look awesome! This is probably my favorite of your quilts! Love the birds and the gorgeous low volume background. Thank you, Audrey. Considering how to put this quilt together pushed me a little. It was either going to be cool or a spectacular fail. I am glad you like it! I really love this quilt. Even though the blocks were made by different quilters, you made it in a gorgeous and coherent quilt! The photograph in the snow suits it, too. Thank you. I'm glad you like the photo...it makes the hypothermia worth it. My husband and I stood on top of chairs in the middle of a snowbank to get this shot. It. Was. Cold. I was quite intrigued by the thumbnail of your quilt on Amy's blog. Seeing it larger caused me to be completely smitten! It's a fabulous quilt. You did a fantastic job of incorporating all the diverse blocks. And your bee mates made outstanding blocks. I love it! Thank you, Leslie! I actually still have some of the blocks left! One of these days I should make a coordinating pillow. Greetings from Germany. Love. Mrs Patch. Thank you from Iowa, Mrs. Patch! This is an amazing quilt! You did an incredible job putting together all the bee blocks in a way that has great flow and rhythm. Jill, no wonder Kaja loves your blog! Thank you, Lara. I like experimenting with layouts. This quilt was set on the diagonal. I got the idea from Color and Composition for the Creative Quilter, which is an awesome book. That's very clever. I participate in "block of the month" at my local guild, and each month I wonder what I'd do with the blocks if I won them all. You've inspired me think outside the square, and not just join them in a grid pattern. This is a great quilt, and you took great photos in the snow. Thanks Wendy! I hope you win the block lotto at your guild. I love what happens when you get into the "I have to make this work" space. Your applique quilt is absolutely phenomenal. I think I would have to be marooned on an island with scissors, thread, needle and fabric for a LONG TIME to make something like that work. This is such a lovely bee quilt! So happy! This quilt blows my mind! It is beautiful and awesome and I think you did an outstanding job! From what I've seen on your blog, I like all of your quilts, but this one tops them all. I love the birds, the low volume, the trees, those little pops of triangles. It all works together so beautifully. I am in awe. And I voted for this one! Thank you, Sharon. It is the neatest feeling in the world to find other people who like the same things that you do. Thanks for your comment and your vote. I truly appreciate both. This is so amazing. I love the idea of improv from so many different people, you're guaranteed to have many unique trees int he forest that way! A queen size quilt is a daunting task but you made excellent work of it here! Thank you, Terri Ann. You're definitely right about the variety! I think an improv block was just like having a signature block from everyone. Beautiful quilt! I love this! It's fantastic!!! Thank you for your comment! I am slowly building my low volume stash back up. Maybe I can do something like this again. This is such a special quilt. Thanks Deborah! I loved making it and I love sleeping under it! !